FAQs Accounts, Orders, Delivery and Returns Questions Answered. How do I set up an account with Mitchell & Cooper? Trade accounts are only available to customers who match certain criteria, for example we do not sell directly to end users. Existing Customer – During the transition to our new ecommerce website all existing website registrations have been reset. We have informed you of your new login details however if you need a reminder please contact us on webmaster@mitchellcooper.co.uk or call the office on + 44 (0)1825 765511. New Customer – New customers wishing to apply for a trade account will need to fill out the new account form which can be downloaded here. We will then contact you with your login details as soon as the account has been approved. Holders of a consumer account will have limited access to purchase products such as spare parts and will not be able to order the majority of products from our main catalogue. Existing Customer - During the transition to our new ecommerce website all existing website registrations have been reset. We have informed you of your new login details however if you need a reminder please contact us on webmaster@mitchellcooper.co.uk or call the office on + 44 (0)1825 765511. New Customer – Visit our registration page and sign up. You will be asked for your details, an email will be sent to your registered email address to confirm registration and you can begin to place your orders. New consumer customers can set up a personal account which will give you access to purchase a limited product selection depending on country location. All UK visitors will have access to all product information including specs and user manuals but only able to purchase Bonzer spares. With a life full of different passwords we aren’t surprised that this has slipped your mind. Please follow the login page and then select forgotten password. An email with a password reset will be send to the account email address. If you have forgotten your nominated email address please contact us on webmaster@mitchellcooper.co.uk or call the office on + 44 (0)1825 765511. If you wish to change your password, this can be done by logging into your account. At the bottom of the my account page is the link to change password. You can update your login details at any time. If you wish to change your details, this can be done by logging into your account. Under account management header you will find “your details”. How do I save a delivery addresses for next time? When you first egister you are asked for your invoicing address, as default this will also be your delivery address. New delivery addresses can be added at the checkout. Every new order that is successfully processed will save a new delivery address to your address book for use next time. If you would like to remove an address from our files so it cannot be used in the future please contact us on webmaster@mitchellcooper.co.uk or call the office on + 44 (0)1825 765511. The site says my email address is already in use, what shall I do? Please request your password using the forgotten password link and follow the instructions in the email to reset. If this fails please contact us on webmaster@mitchellcooper.co.uk or call the office on + 44 (0)1825 765511. To receive our catalogue, you can either go to the home screen, scroll down and select Catalogue downloads or request a hard copy to be sent using the contact us form. We produce a new catalogue every year, which are released in January. Viewing your existing orders, invoices, credit, shipment and returns notes. If you have a credit account you can view and print your statement, invoices and credit notes online. You will need to be logged in to use this facility. They are accessed from the “My Orders” (Order History) page. Then adjust the document type before searching. I already have a credit facility which I want to use online. If you do not have a credit facility please contact us on webmaster@mitchellcooper.co.uk or call the office on + 44 (0)1825 765511 with your account number, invoicing address and email address. We will send you an application form. If you already have a credit facility and would like to use it online please contact us on webmaster@mitchellcooper.co.uk or call the office on + 44 (0)1825 765511 with your account number and invoice address. We will arrange to make it available online for you. You can find an item by using the search box located at the top of the page or by browsing through the categories using the drop down menu. If you have a copy of our catalogue you can enter the product code into the search box. You can also browse items by brand by clicking the 'Brand' button located in the menu. Of course if there is anything that you can’t find please contact sales@mitchellcooper.co.uk or call the office on + 44 (0)1825 765511. We are specialist in sourcing products for our customers. How do I View and Update My Basket? If you wish to change the number of items or remove items completely from your basket you will need to go to the 'Basket' screen by clicking the shopping trolly in the top right or view shopping cart button. You can overtype the number required in the 'Qty' column and save your changes by clicking the ‘recalculate shopping cart’ button located next to the number field. If you wish to delete an item completely then click the 'Delete' button located on the row. Can I order out of stock products? Yes, add them to your cart as normal. The out of stock product will be despatched as soon as it’s available. If there is a problem our customer service team will contact you. Once you have finished adding items to your basket, click the 'Proceed to Checkout' button and follow the steps to complete your order. If you are a new customer you will be taken through a registration process before selecting a delivery address and choosing a delivery type. When you get to the 'Confirmation' screen you can check that all the details you have entered are correct and that you have all the items that you wanted to order. When you are happy click the 'Submit Order' button. You will be provided with an order reference number and a confirmation email. If you are a trade customer this facility is available. If you already know the codes of the products you require (as printed Mitchell & Cooper catalogue and price list) you can use the Fast Order screen rather than browsing the site. 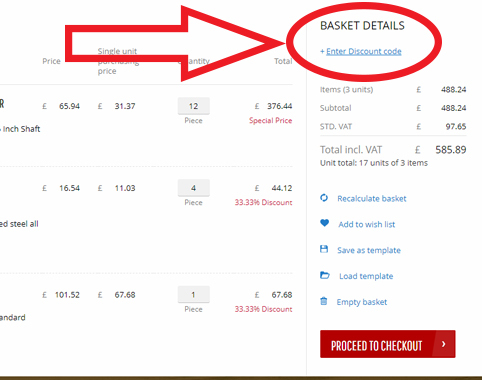 Click the 'Checkout’ button at the top right of the screen. Enter the product codes and quantities required into the form, then click the 'Add to Cart' button. There is no limit to the number of times that you can use the screen per order. You can view the status of an order and track its progress with our carrier. Order tracking is available from 'My Account'. Please note there may be a small delay while orders are processed and tracking numbers are assigned. No tracking number will be available until the order has been despatched. If you need to cancel or amend an order after submitting it, please contact our customer services team on webmaster@mitchellcooper.co.uk or call the office on + 44 (0)1825 765511 with your web order number and full details of the amendments required. We accept Visa debit and credit cards, Mastercard, Switch Maestro, Electron, Solo or American Express cards. Please note that prices on the site are displayed excluding VAT. If you wish to know how much your total will be including VAT, please view your shopping cart where a total including VAT can be seen. Within the UK - We accept Visa debit and credit cards, Mastercard, Switch Maestro, Electron, Solo or American Express cards via this website. All products sold from the website are subject to a 1 year warranty on parts and labour. Some items such as EZ series can openers and Nemox ice cream machines for example offer a longer warranty or on site warranties respectively. Any changes from the standard 1 year warranty will be highlighted on the product page. Within the UK – Order values over £150, delivery is free of charge. For all order values which don’t reach £150 will be charged at just £5. All UK orders will be despatched on a next day service (when possible). Orders processed before 3pm will be despatched the same day. UK mainland orders will be delivered next day. Channel Islands, Scottish islands, Isle of Wight, Isle of Man and Channel Islands will take up to 3 days delivery. Do you offer weekend delivery slots? We can arrange for Saturday morning delivery if required within the UK mainland. Please select this during checkout. There will be an extra charge included. Why have I not received my order the next day? We use reliable services to deliver your products on time, however there can be times when this is not possible. We will provide you with a tracking number so you can keep an eye on the progress if required. If you have any concerns please contact us with your order number on +44 (0)1825765511 or email sales@mitchellcooper.co.uk. If you would like to return an item for any reason please email us on sales@mitchellcooper.co.uk with the returns form attached. Click here to download. Please provide us with as much information as you can and we will process the request as soon as possible. Who do I contact with a specific enquiry? In the first instance please double check the product page. We endeavour to provide as much information as we can online. If you need further assistance please start a new web chat or contact our customer service team on sales@mitchellcooper.co.uk or call the office on +44 (0)1825 765511 and one of our experienced customer service team should be able to answer any of your questions. Once again enter the discount code at the shopping cart page. We endevour to update the FAQs Section on a regular basis. If there is an answer you can't find please contact us.